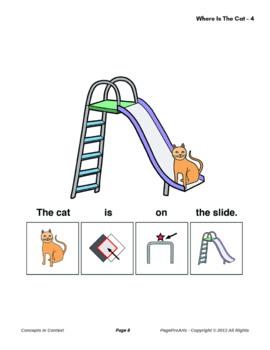 This story is about a cat named Pike. Kimmi, Tina, and Rockee look for Pike in four places. They find the cat “in, “on”, and “under” different things in the backyard. There is a dramatic rescue when Rockee brings Pike down from a tree and then a happy ending. 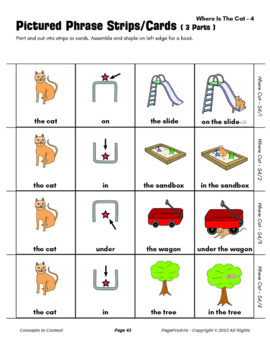 There are activity pages at the end with three cats in the backyard, sentence strips highlighting place/preposition, and coloring pages. - pages can be turned by swiping right to left from the right side of the screen or choosing the page arrow. - touching a cat will turn the page. - on the activity pages, images and words can be circled, crossed out, colored or written with the drawing tool in the app. 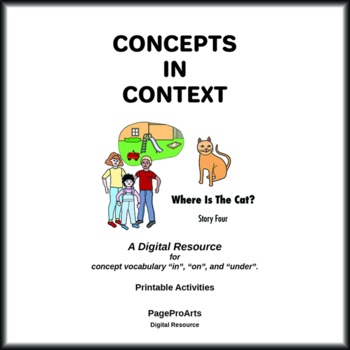 - a printable pdf can be found at pageproarts.com or teacherspayteachers.com/Browse/Search:pageproarts. These activities are best used in an individual or small group setting with a therapist, instructor or parent. 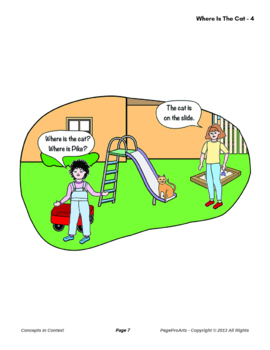 Emphasis is placed primarily on visual display of key elements so that the cognitive and linguistic aspects of the story are communicated to children who are developing thinking and language skills. Learners in the early stages of development can explore the words and ideas that tell a story and enhance vocabulary development.